IN HER SECOND NOVEL, The Ministry of Utmost Happiness (2017), Arundhati Roy asks, “What is the acceptable amount of blood for good literature?” This relationship between the imagination and the stuff of real life—violence, injustice, power—is central to Roy’s writing, dating back to her Booker Prize–winning debut novel The God of Small Things (1997). For the twenty years between the release of her first and second novels, the Indian writer has dismayed many—those who preferred that she stick to storytelling and those who were comfortable with the turn of global politics around 9/11—by voicing her political dissent loudly and publicly. Her critical essays, many published in major Indian newspapers, take on nuclear weapons, big dams, corporate globalization, India’s caste system, the rise of Hindu nationalism, the many faces of empire, and the U.S. war machine. They have garnered both acclaim and anger. In India Roy has often been vilified by the media, and accused of sedition, for her views on the Indian state, the corruption of the country’s courts, and India’s brutal counterinsurgency in Kashmir. She has, on one occasion, even been sent to prison for committing “contempt ofcourt.” In spite of this, Roy remains outspoken. In this interview, she reflects on the relationship between the aesthetic and the political in her work, how to think about power, and what it means to live and write in imperial times. AVNI SEJPAL: You once wrote that George W. Bush “achieved what writers, scholars, and activists have striven to achieve for decades. He has exposed the ducts. 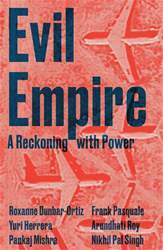 He has placed on full public view the working parts, the nuts and bolts of the apocalyptic apparatus of the American empire.” What did you mean by this, and ten years and two presidents later, is the American empire’s apocalyptic nature still so transparent? ARUNDHATI ROY: I was referring to Bush’s unnuanced and not very intelligent commentary after the events of 9/11 and in the run-up to the invasion of Afghanistan and Iraq. It exposed the thinking of the deep state in the United States. That transparency disappeared in the Obama years, as it tends to when Democrats are in power. In the Obama years, you had to ferret out information and piece it together to figure out how many bombs were being dropped and how many people were being killed, even as the acceptance speech for the Nobel Peace Prize was being eloquently delivered. However differently their domestic policies play out on home turf, it is a truism that the Democrats’ foreign policy has tended to be as aggressive as that of the Republicans. But since 9/11, between Bush and Obama, how many countries have been virtually laid to waste? And now we have the era of Trump, in which we learn that intelligence and nuance are relative terms. And that W, when compared to Trump, was a serious intellectual. Now U.S. foreign policy is tweeted to the world on an hourly basis. You can’t get more transparent thanthat. The Absurd Apocalypse. Who would have imagined that could be possible? But it is possible—more than possible—and it will be quicker in the coming if Trump makes the dreadful mistake of attacking Iran.